Effective arts integration facilitation is simply good facilitation, putting the focus more on the learner and less on the teacher. DEFINITION: What is Facilitation in an arts integration PD experience? Facilitating an arts integrated learning experience means actively involving learners, individually and collectively, in hands-on, arts-based experiences in order to increase knowledge and/or skill with both the art discipline and the connected subject. Quality facilitation moves simple participation into building, understanding, interpreting, and problem-solving, as well as critical and creative thinking, to help participants become self-directed learners. Effective arts integration facilitation is simply good facilitation, putting the focus more on the learner and less on the teacher (See chart below). PURPOSE: Why is Facilitation important to an arts integration PD experience? 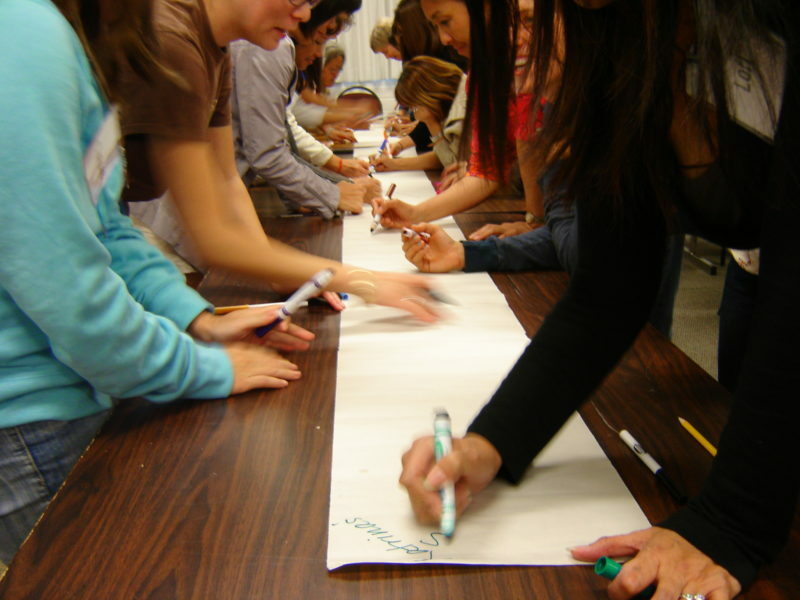 In a PD experience, facilitation refers to both how a teaching artist conducts a PD experience and what the classroom teachers learn about conducting effective and engaging arts integration lessons in their own classrooms. A teaching artist guides classroom teachers as they build their own capacity to design and facilitate arts integrated experiences, strategies and lesson plans. How a teaching artist manages a PD experience with classroom teachers, then, serves as a model of quality facilitation for the participating classroom teachers. A skillfully designed PD experience focuses not only on what a teaching artist needs to demonstrate to the classroom teachers, but also helps them analyze and understand how and why the experience is facilitated in such a way. Were more consistent in their management of learning and behavior. They were more likely to offer explanations when refusing pupils’ requests and in dealing with the negative behavior, they frequently referred to similar incidents in their own past, thereby indicating to the pupil that while they were unable to condone certain actions, they understood the reasons why such incidents occurred. So many professional development classes don’t allow for the opportunity to practice parts of what we learn, with feedback, before we have to implement full lessons in our classrooms. The way that the course is structured and taught, mirrors effective teaching strategies which makes it easier to transfer into the classroom. IN PRACTICE: How might Facilitation be applied to an arts integration PD experience? The goal of an arts integration PD experience is for classroom teachers to walk away with the skills and knowledge to immediately facilitate arts activities, strategies and techniques in connection with other content, with their own students. Identifying and analyzing quality facilitation in a particular art form for and with participating classroom teachers is important, as each discipline requires specific choices. In general, however, facilitating creative work includes (but is not limited to) the following. On the third and final day of a PD course, teachers practice facilitating each other. After experiencing a strategy of Move and Freeze as students might, the classroom teachers describe what they notice about what the teaching artist said and did to facilitate their creative movements. Next, the teaching artist introduces a prescribed set of facilitation steps, written on a chart and posted in several locations around the room. The teaching artist prompts classroom teachers to select a word or image from the grade-level text that they will use as a movement prompt. Classroom teachers briefly plan, using a template based on the charted facilitation steps. The teachers make specific decisions about how to coach, revise, and/or question others. As partners, classroom teachers take turns facilitating each other through the strategy. Next, in groups of four, teachers practice facilitation again. Finally, one teacher facilitates the whole group. Teachers debrief what the experience was like for them as facilitators, identifying the areas that challenged them the most, and highlighting some of the strong choices their peers made. In a 3-hour PD experience, the classroom teachers prepare to facilitate the strategy of pantomime after having experienced it. The teachers and teaching artist reflect on the facilitation steps demonstrated by the teaching artist, then the teaching artist offers classroom teachers a selection of vocabulary words or text to use as the focus of their facilitation practice. The teachers plan out their facilitation steps using one of the words or selections and then teachers gather in groups of 4 or 5 and take turns facilitating their group members through the strategy. Next, the teaching artist guides the teachers to reflect on their experience; which steps were most challenging, where they felt most comfortable, what they might do differently, any questions they have for clarifying the facilitation and what they noticed about each other’s choices. In a collaborative residency where a teaching artist and classroom teacher are co-teaching the students, the classroom teacher facilitates a singing games activity she has learned during an earlier PD experience with the teaching artist. In previous weeks, the teacher has observed the teaching artist leading similar model lessons. The teaching artist now observes the teacher’s work. The residency includes meeting time so that the teaching artist may confer with the classroom teacher about successes or challenges with the strategies. Each conversation is based on what the teaching artist has observed, but, more importantly, on the classroom teacher’s reflection on their own experience. The teacher may discuss their own confidence level, unexpected reactions from the children, the sequence of the activity, the creative contributions from students, or any number of other reactions to their own leadership. It’s important that these sessions are not seen as negative or as critique designed to focus on what didn’t work. Instead, the discussions focus on the teacher’s experience. These reflective conversations will guide the teaching artist in choosing which aspects of facilitation to emphasize during each successive model lesson. The intended result is a residency that builds a high level of teacher confidence and ability, leading to long-term, successful implementation of the strategies by the classroom teacher. During a 1-day workshop on creating inquiry-based museum experiences that connect to Social Studies and Science standards, classroom teachers participate as learners in a range of protocols that encourage active responses to artwork. A protocol is a structure that makes it safe for participants to listen, challenge each other, and ensures that all voices are heard. For example, in the ODI+1 protocol (see Resources), six teachers gather around a piece of art and observe it for one minute in silence. They begin by describing the artwork in detail, including the language of the elements and principles. Next, they discuss their interpretations or inferences about the meanings depicted within the artwork. Finally, each asks a question or a makes a “wondering” statement about the artwork. After exploring multiple protocols such as this, classroom teachers move to an exhibition that is new to them. In small groups, each teacher chooses from one of the protocols and takes a turn facilitating this for others. After this practice-round of facilitation, teachers reflect as a group on how they might implement these protocols with their students. Identification: The classroom teachers identify steps and choices made by the teaching artist while facilitating the in-workshop learning experience. The teaching artist and classroom teacher review the procedural steps to help clarify how to scaffold and apply. Analysis: The classroom teachers analyze the purpose and benefits of an arts integrated learning experience, identifying how it addresses particular outcomes, learning targets and standards in both the arts and the connected subject. Practice: The classroom teachers practice facilitating, either by designing a practical application of the activities, strategies or lesson plans, or actually leading arts-based strategies with their peers as the students. Ask questions/Pose challenges: Prompt participant creative work through open-ended questions that encourage participants to make personal choices based on their own experience and understanding. Offer feedback and encouragement to inspire creativity, risk and ownership: Positive feedback encourages risk, negative responses either elicit fear of involvement or the need to seek answers that make the teacher happy. Champion the journey over the destination: Engaging participants in an arts integrated learning experience is as much about how they learn as what they are learning. The quality of the experience of critical examination and creative expression encourages participants to take risks, trust their choices and seek out the possibility of returning to the learning journey to discover and learn more. Each art form includes specific language, materials, guidelines, skills training and benefits. See below for examples related to various art forms (See Arts Content). Quality facilitation also includes the Framework Components of assessment and reflection (See Assessment, Reflection). Observation: Teachers observe, take notes on, and discuss the teaching artist’s facilitation process, possibly during the workshop, from a video or in a classroom setting. Handouts: Materials the teaching artist provides outline how to facilitate specific strategies or techniques in detail. The teachers and teaching artist read over the materials in tandem with the workshop observations or experiences. Materials might also include detailed lesson plans that reflect exactly what the teaching artist demonstrated. Facilitation Practice: Teachers practice facilitating, in the workshop setting and in their own classrooms, with opportunities to reflect on and discuss their accomplishments and challenges, in both written and oral form. Feedback: Teaching artist comments on and provides feedback to teachers on their initial and ongoing facilitation experiences. See the Extend section for additional ways to practice facilitation. Throughout a PD experience, teaching artists might keep in mind a rule of three as they conduct the workshop: tell teachers what is going to happen, make it happen and then reflect with the teachers on how it happened.